At last month's Baltimore plenary, one of those things that, not all that long ago, would've fallen into the "Never In A Million Years" category quietly came to pass: the US bishops were given a presentation on things digital and Web 2.0. If nothing else, the mini-seminar served to let loose a flurry of text messaging on the floor... but even so, let's just be grateful that it happened -- watching it unfold was, admittedly, one of the more surreal experiences of recent times. Truth be told, a fare share of the bench still gets its online reading printed out. But right alongside it, an ever-growing bunch of high-hats has emerged, brandishing iPhones, talking up geotagging, viral media, social networking -- and, of course, the blogosphere -- and putting it all to good use at the top level of their local churches. Some of us might be just a little biased on this, but you'd have a hard time arguing that the development isn't a very good thing; ecclesial life is, after all, rooted in a certain Commission to "go out into all the world," but to stick together along the way, too. And just as centuries' worth of grand buildings aiming for perfection and prominence sprung up along main arteries, atop high hills, in city squares and newborn suburbs as the main vehicle of announcing this presence -- with no expense nor effort spared -- these days the same thing can be accomplished along a much bigger highway with just a handful of clicks... and it can all be done without ever leaving home. That said, though, it's worth underscoring that technology alone can never be seen as a cure-all -- or, for that matter, a be-all -- in ecclesial life. At its best, it's a crucial supplement for the many folks who find that one hour a week just isn't cutting it, an optimal means of outreach to those who find themselves far afield, the ultimate communion-builder across geographic and philosophical lines and a means for sharing and building on information and ideas literally to the ends of the earth. At the same time, however, its excesses can easily lead to isolation, division, an ignorance of the world outside one's window and the all-too-human temptation to avoid or ignore authoritative teaching and replace it with a pseudo-Magisterium that just so happens to tickle our ears. Yet even for its dangers, the net is not something to merely be tried, but mastered -- the hunger out there is greater than any of us are able to sense, just as the work needed to fill the void is greater than any one or handful of us can accomplish on our own. And while no page or program can ever replicate nor substitute the nourishment and grace that come with flesh-and-blood sacramentality, what today's tools make possible is, simply, an accessible taste of it that keeps no shortage of folks energized and connected along the way and, more than just sometimes, is powerful enough to add to their number. And, really, what's not to love about that? OK, end of preach... but its point: a recent piece in the Arkansas Catholic highlights the Facebook cred of the state's newly-arrived bishop, Little Rock's Tony Taylor. Facebook reports more than 120 million registered users. Of these, the fastest-growing segment is people 25 and older. The site is free to users, but small advertisements are interspersed with the content. Only Facebook members can view the site. Members can join networks based on cities, workplaces and campuses to find friends and co-workers in the system. Every member has a profile page where he or she can add work and personal information, as well as install applications that perform a wide range of functions. Members can view their friends' profile pages, send private messages, share photos and interact in a variety of ways. Based on their interests, members also can join groups and fan clubs. Shortly after being ordained in June, Bishop Taylor said he was told a fan club had been created about him on Facebook. When he went online to look at the page, he realized he had to sign up to see it, so he did. Editor Jack Smith of the Catholic Key, newspaper for the Diocese of Kansas City-St. Joseph, Mo., posted to his Oct. 2 blog that a few bishops had begun to follow Bishop Taylor onto Facebook, while many others had a presence through fan clubs. Stephen Elser, 17, a senior at Catholic High School in Little Rock, attended Bishop Taylor's ordination with his uncle Father Bill Elser of Benton. Afterwards, he was so enthusiastic and joyous about finally having a bishop, Elser went onto Facebook and found the "Bishop Taylor Fan Club." The administrators had abandoned the page so he took it over and invited all his friends to join. Elser said his goal was to get Bishop Taylor to join Facebook, which he did shortly thereafter. "It actually kind of surprised me, I mean I hoped he'd get one, but it was just surprising," Elser said. 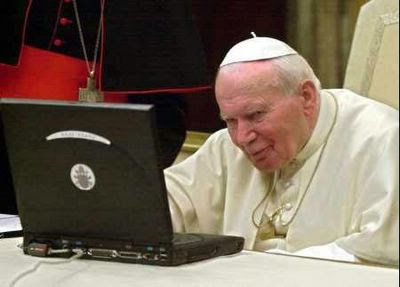 "I thank God he did because I like how he posts his homilies." Bishop Taylor has been posting his homilies in English and Spanish to Facebook since July. On Nov. 7, after releasing his first pastoral letter, "I Was a Stranger and You Welcomed Me ..." he posted his summary outline with a link to the letter on the Diocese of Little Rock Web site. Bishop Taylor said of his membership on Facebook, "I want to be available and accessible to everybody in the diocese." And "this is a way to be present to the younger people of the diocese." Though unable to respond to the many messages he receives, he does accept all friend requests. Beyond the diocese's youth, he is friends with people of all ages worldwide who are laypeople, clergy and religious. The bishop also gets numerous invitations on Facebook to attend high school youth and campus ministry events from around the state. "I'm not able to go to hardly any of them, but I become aware of what's going on," he said. Elser, who is considering the priesthood, said he thinks the bishop's presence on Facebook is a big deal for his age group. "I think that allows him to get to know us and relate to us in a way that he couldn't do before," he said. "It could help foster vocations also." "I want to be part of their lives," Bishop Taylor said. "Technology like anything has good points and weak points. But it can certainly be used to spread the Gospel and to build up the community." E-church barriers keep falling these days at an ever-more rapid clip... and now it can be told that another big one is down. First, there was the Bloggin' Eminence in Boston... but he only publishes weekly. Now, from the home-church of the, er, 2008 World Series Non-champions, Bishop Robert Lynch of St Petersburg has spent the last two months posting to his new blog, To His Friends, on a near-daily basis. A former Lord of the Mothership, USCCB Communications and CRS chair, Lynch's inspiration to do the page -- a replacement for St Pete's recently-folded diocesan newspaper -- might've come from a pretty strange place... but, hey, whatever gets the job done. On-deck: a piece on the impending arrival of the "new curia."